Don’t you just hate driving around in circles looking for a car park in a busy parking lot and not knowing if there are any spaces vacant? Australian Bollards has taken the guesswork out of finding that car spot with their Electronic Display System. 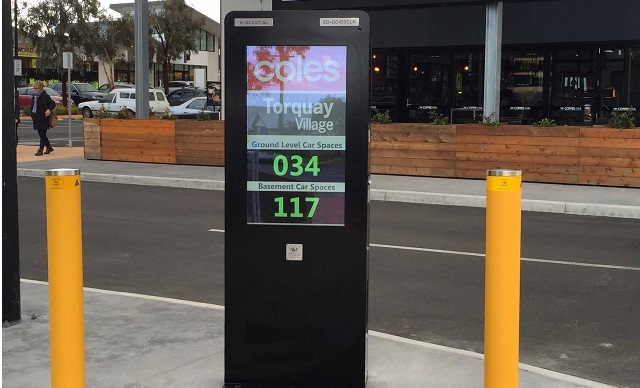 Our IP65 rated Electronic Display Systems can be used in car parks as a variable message systems like the one installed at Coles Torquay Village. The system is integrated with car park sensor technology to display to drivers how many car spaces are available in both the basement car park and the ground level car park. The advantages of this is that drivers can quickly verify whether there are any car spaces available, saving them valuable time. The Electronic Display Systems can be set on a timer to turn on and off at particular times, as well as being waterproof and suitable for outside applications. They are compatible with Windows software, they are touchscreen and can also be operated from a remote location such as a car park office. The ED-DC420CLH is complemented by our other access control products such as car reader heads and boom gates. They can also be used as a pricing board at entry points of car parks as well as advertising in shopping centres and hospitals. Australian Bollards have both outdoor and indoor specific Electronic Display Systems available that can be customised to suit your specific application.